« Tomb Raider (2018) – A Most Enjoyable Video Game Adaptation! Enjoy this Easter special adventure based on the classic picture book that has sold more than 30 million copies worldwide, written by Sam McBratney, illustrated by Anita Jeram and published by Walker Books. When Little Nutbrown Hare sees a pure white fawn shining and dancing in the moonlight his friends think he s making it up. They venture through the woody woods in the next valley, down the streamy stream and pass the rocky rocks to find her but as their doubt grows, she is right there hiding on the patches of white snow, thinking it s a big game of hide and seek. She promises to visit them on Easter Day making Easter that much more special for all. KIDS FIRST! 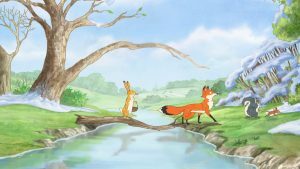 Film Critic Carla P. comments, “This film has beautiful animation and an adorable storyline that I love.” Nathalia J. adds, “It’s so rare to find a truly quality children’s film such as this. I love how the storyline brings together so many themes including friendship, believing, togetherness and Easter. Wow! What an amazing combination!” Morgan B. wraps it up with, “Easter is on its way and this hare is perfect for the holiday season. The life lessons are about friendship and being kind to others. We see this in the kindness extended to the pure white fawn when they show her that they can be friends.” See their full reviews below. 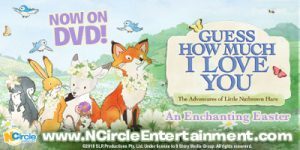 The DVD Guess How Much I Love You: An Enchanting Easter is a great movie for the whole family. This film has beautiful animation and an adorable storyline that I love. Guess How Much I Love You: An En chanting Easter follows a group of forest animals. One, the Little Nutbrown Hare sees a pure white fawn that enchants him. 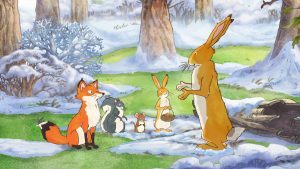 He tells his father and his friends – the field mouse, the fox and the grey squirrel. They do not believe him at first but Little Nutbrown Hare convinces them to help find the white fawn. The animation in this series is adorable. The characters and background are very colorful. In every scene, there is always a pop of color, whether it is a vibrant blue or a soft pink. The characters look just like the illustrations in the original book, which I love. It is remarkable how detailed the characters are. For example, the fox has orange fur that fades at the end. It looks like a watercolor painting. 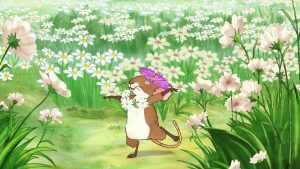 If I was to pick my favorite character, it would be the field mouse or perhaps Little Nutbrown Hare’s father. I like the field mouse, because he is the only one who believes in Little Nutbrown Hare and what he saw. 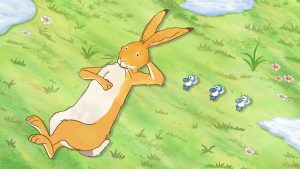 I also like Little Nutbrown Hare’s father, because he is so kind. He takes care of the mother bird’s eggs while she goes to get feathers for her nest. When the birds hatche, he takes them to where he kept warm during the storms until their mother cam back. The message of this movie is to trust your friends. The fox and the grey squirrel did not believe Little Nutbrown Hare’s story about seeing a pure white fawn. The only one that really believes him is the field mouse. He keeps Little Nutbrown Hare’s hopes up when his friends did not believe him. I rate this DVD 5 out of 5 stars and recommend it to ages five to seven. This is available on DVD so, look for it. Easter! I love Easter! This 30 minu te fantastic, delightful and pure film is directed by Jo Boag. It’s so rare to find a truly quality children’s film such as this. I love how the storyline brings together so many themes including friendship, believing, togetherness and Easter. Wow! What an amazing combination! Get ready to head down a road filled with adventure. 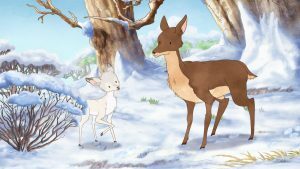 The story follows Little Nutbrown Hare leading a journey to find a pure white fawn that he sees shining and dancing in the moonlight near his village. His friends think he’s making it up. They take a gamble endeavor through the woods in the next valley, down the flowing creek and past the rocks to find her. As their doubt grows, she is right there hiding on the patches of white snow. She instantly thinks it’s a big game of hide and seek. She promises to visit them on Easter Day, making Easter that much special for them all. 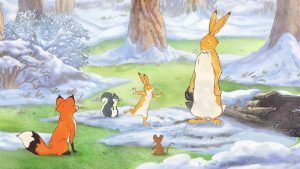 This film is based on the classic book that has sold worldwide, written by Sam McBratney, illustrated by Anita Jeram and published by Walker Books. The animation is astonishing from beginning to end. The characters are beautiful, colorful, appealing and attractive throughout the entire movie. This film is downright delightful, bringing so much joy for one to appreciate. I just love the animals, especially the cute baby birds! The music really supports the lovely characters and action. 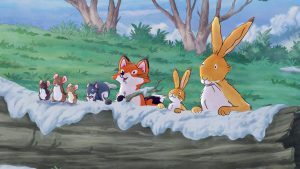 My favorite part is when Little Nutbrown Hare and his friends save the pure white fawn from drowning in the stream. It shows how much he cares and adores her. Absolutely touching! This part in the film has many different actions happening at the same time. All of Little Nutbrown Hare’s friends find out the pure white fawn is real and not in Little Nutbrown Hare’s imagination. At this moment they are reminded the world is full of marvelous animals. My favorite characters are the pure white fawn and Little Nutbrown Hare, because they are both happy, intriguing, playable and friendly. This film has a great message of friendship and love and the meaning behind them. True friendships are displayed in this film and we see the genuine love and understanding the characters have for each other. It absolutely calls you to action when they venture out to find pure white fawn. All the characters treat one another appropriately, helping help each other, saying nice things and being friendly to one another. I give this film 5 out of 5 stars and recommend it for ages 3 to 11, as well as adults. This film is available now on DVD and Digital, so go check it out before Easter. I love Guess How Much I Love You: An Enchanting Easter! It is a great addition for my collection of Easter movies because it is so cute! Easter is on its way and this hare is perfect for the holiday season. The life lessons are about friendship and being kind to others. We see this in the kindness extended to the pure white fawn when they show her that they can be friends. The other life lessons are about teamwork and believing in your friends. The animation is just breathtaking. It is so perfectly executed that it looks like a perfect little story book with live animals. The scenes with the snow are amazing because of the color mix. It is truly magical. My favorite character is the pure white fawn. She is a new character that I will always remember. I love her personality. She has a sweet side, which she shows towards the end of the film and a funny, silly, playful side that she shows in the beginning. I am in love with her character’s voice which is so soft and sweet, making her the perfect fawn. Her interaction with all the different animals shows that she fits right in and they all gain a new BFF. Another thing that I like about this DVD are the voiceovers. They match the characters wonderfully with their soft tones, making sound a lot like young children. Each character has a small, adorable and squeaky voice. All the animals are lovable and each on e has a different personality. This makes me feel like I am meeting them for real. I want to jump into the screen and give them a big welcome hug. It also makes me want to jump through the TV and play in the meadow as they celebrate Easter. This is a perfect way to get into the spirit of spring after a long, cold and rainy winter. I recommend this DVD for kids age 4 to 13 and give it 5 out of 5 stars. It is available now on DVD so look for it. This entry was posted on Tuesday, March 20th, 2018 at 4:43 pm and is filed under DVDs Released. You can follow any responses to this entry through the RSS 2.0 feed. Both comments and pings are currently closed.